We delivered our first teacher kits today at Amerigo A. Anastasia School in Long Branch. These kits have everything needed to extract DNA with elementary age students (except the strawberries)! After we deliver an in-person workshop with a school, we then provide kits for the teachers to use the acitivity in the future at low cost. We are grateful to the European Society for Evolutionary Biology which provides funding for both the in class workshops and the teacher kits. 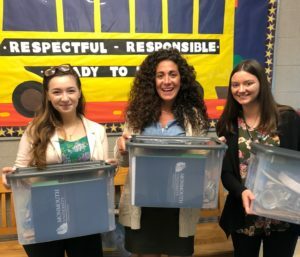 Katie Banfitch (MU School of Science, left) put together the kits based on her experience last semester as our outreach coordinator and Jessica Alonzo (middle) facilitated all of our work at the school.